It has certainly been awhile since I last posted. I had great intentions of creating several new paintings, but life intervened when my father unexpectedly passed away the first part of September and I flew off to Illinois to be with my family and to say good-bye. It has been an interesting journey these last several weeks and I have gone through a whole range of emotions as people do when they lose someone close to them and struggle to get on with life knowing that there is now someone missing out of it that they will never see again. It has been hard for me to get back to painting, but commissions were waiting and I knew it's what he would want me to do. He enjoyed hearing about my artwork and had kept a file of the email images I sent him of my most recent works, especially the wildlife art. 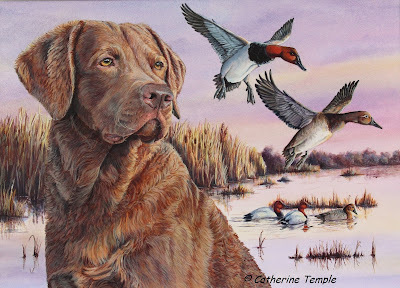 He was an avid outdoorsman and my interest in art, nature and birds are my legacy from him. So I picked up my paints again and this was the image I chose to paint. 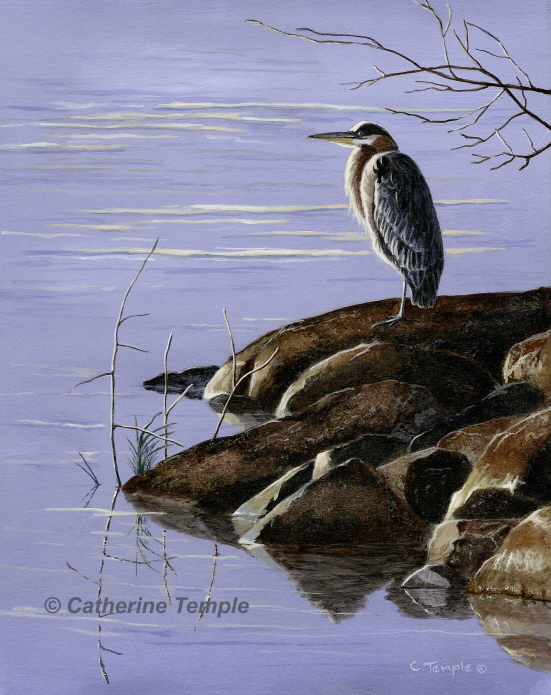 I saw this great blue heron one cold, November morning as I walked along the river near my home. The sun was just coming up and he stood facing it as the first rays warmed him. The early morning light illuminated his feathers and he seemed to glow. 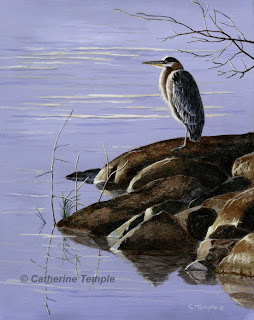 I knew immediately that this would be a painting some day and the name came just as quickly..."Sunrise Sentinel". I've been waiting to paint it for quite some time and for some reason it seemed appropriate to do now. I'd like to think this painting has something to do with my father, but I'm not sure if there's special meaning here or not. Certainly, my father loved the water and loved birds of all kinds. And I know he spent a fair number of mornings watching the sunrise over the lake he lived on in Kentucky. I'm sure he would have loved this painting, though the herons often gave him fits when they came in to his koi ponds looking for an easy meal. Perhaps this painting is more about me than him at this time. I seemed drawn to it for it's peaceful, contemplative quality. The heron seems to be paused at a moment in time, quietly watching. And that's how I've felt lately..."paused". I have spent many hours reflecting on past memories and pondering what the future may hold and how this event, the passing of my dad, affects my life from here on. I suppose, at times like this, it is natural and normal to reflect on the briefness of ones' life and what you would like to do with the time you are given. It certainly has affected me this way. I'm sure that will translate to my art in some way, but I'm not sure what that will look like just yet. I guess you'll know when I know as I'm sure I'll share it here. Perhaps we should all be like this heron today...pause for a moment and reflect on our blessings, our loved ones, our life and remember how brief our time together is. I leave you with blessings and peace.